It seems a bit strange now, but there was a time thirty years ago when Al Lowe was famous not for his adult humor, but rather for his excellent children’s games. 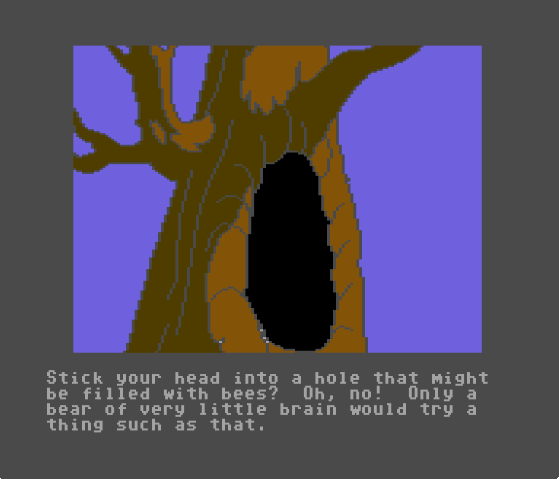 His first efforts as an independent programmer brought us Dragon’s Keep and Troll’s Tale, both in 1982. Sierra was very impressed by these games and not only bought the publication rights, but also hired Mr. Lowe to develop games for them. Over the following years, Lowe would come to create several more adventure games for children including Mickey’s Space Adventure (1984), Winnie the Pooh (1985), and The Black Cauldron (1986). One further game, Donald Duck’s Playground (1984), was primarily a collection of minigames implemented in an adventure game engine. Mr. Lowe’s successful career as a children’s game developer would come to an end in 1987 with the launch of his Leisure Suit Larry series. He would return to this genre roots only once more, Torin’s Passage in 1995. In a world with infinite time, I would love to play through Mr. Lowe’s back catalog as a series of Missed Classics, but perhaps that will come another day. Cover page for Pooh’s first book. After making games based on Disney’s main characters, Mickey Mouse and Donald Duck, the Disney/Sierra collaboration turned to a set of characters that Disney owned but did not create: A. A. Milne’s Winnie-the-Pooh. Pooh first appeared in print as Edward Bear in the poem “Teddy Bear” for Punch Magazine in 1924. Two years later in the introduction to Winnie-the-Pooh, his first book of short stories, Mr. Milne explained that Christopher Robin (his son) had renamed his teddy bear to the universally recognized name he has today. Additional Pooh poems and stories appeared in Milne’s Now We Are Six in 1927, followed by a full collection of short stories in The House at Pooh Corner the following year. Four decades later, Disney bought the rights to Pooh and all of his friends to produce new material. 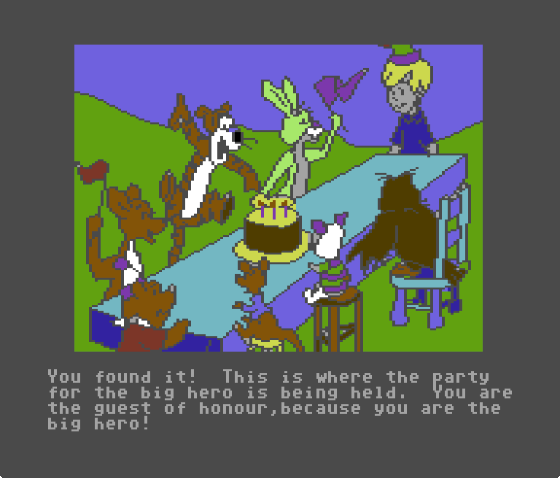 By the time our game rolled around, Pooh had appeared in five animated shorts, three of which were adapted into the 1977 compilation film, The Many Adventures of Winnie the Pooh. Children in 1985 may have been most familiar with the characters from the show Welcome to Pooh Corner (1983—1986), a live-action series with puppetry that was a staple in the early days of the Disney channel. The Pooh franchise has snowballed since then into four more theatrical films, nine direct-to-video films, four holiday specials, three more television series, a comic book and newspaper strip, and six more video games. Not bad for a “bear of little brain” and his friends! A word on punctuation before I get inundated with comments: the Pooh of the books is always hyphenated (“Winnie-the-Pooh”), but the Disney character always uses spaces (“Winnie the Pooh”). I’m sure there’s some convoluted legal or marketing reason for this, but I’m going to try to stick with the latter for this game as it is a Disney product. If you are unfamiliar with the Pooh stories, the plot is fairly simple: Winnie the Pooh lives in the Hundred Acre Wood with his friends including Piglet, Eeyore (a donkey) Rabbit, Owl, Kanga and her son Roo, and Tigger (a bouncing tiger). They are visited by their human friend Christopher Robin from time to time for adventures. In “real life”, at least in the early stories, we are told that these adventures are stories told to Christopher by his father about his son’s stuffed toys. Pooh is the “bear of little brain”, always cheerful but rarely clever. Tigger is the next best-known character, a tiger who claims to be the world’s only “tigger”, capable of bouncing on his spring-like tail. A late addition to the group, he did not appear until the fourth collection of stories. Other characters include the insecure Piglet, the eternally depressed Eeyore, the curmudgeonly Rabbit, and the long-winded Owl. I’ve recently gotten back into the Pooh stories as my son has fallen in love with the characters. Around our house the “Pooh bear video” is hands down the most requested single form of entertainment, but we don’t let him watch it all that often. I’ve tried reading him the stories, but he’s a bit too young yet for them. I have a feeling he’ll enjoy them when he’s a bit older. If the game was just about mapping and returning found objects to their owners, that might be enough. But there are three additional twists: Tigger, the mist, and the wind. Every once in awhile, Tigger will come and bounce you around the map to a random spot. Not only do you have to figure out where you landed, you also dropped your item by accident! Similarly, if the mist rolls in, you will have to wander around aimlessly for a few turns and find yourself in another part of the forest. Finally, the wind will occasionally spread all of the objects that you have not already returned to their owners back around the forest. Even once you find all of the objects and return them to their owner, you have one final puzzle: where might Christopher Robin be hiding to give you your reward? The interface also offers a small challenge as you and the room you are in can only hold one object at a time. That means that some puzzles will require you to juggle inventory, moving objects to other rooms, to make room for the item that you need to place. 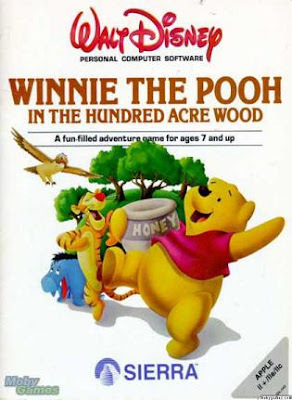 As in the book, the game opens with Pooh as a stuffed toy. 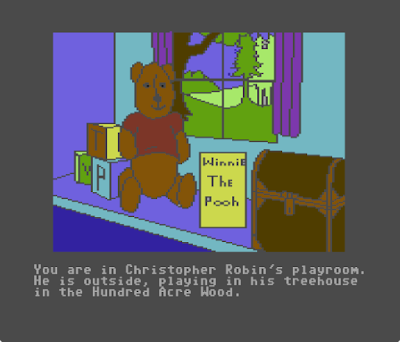 The game opens in Christopher Robin’s playroom, presumably in the “real world”. In this and every other room, you are given a list of possible actions. This almost always includes the cardinal directions, but most rooms have location-specific actions as well. Some of the options are very conversational, some allow you to interact with the objects nearby, and others are just a bit of fun and allow Mr. Lowe to show off his mastery of Pooh trivia. In all cases, you can toggle between options using the spacebar or a joystick, or by pressing the first character on the keyboard (“w” for “west”, etc.) The playroom also acts as the saving and loading interface: you can save your place by opening the toy box and putting your toys away. It’s very intuitive for the little ones! No swapping of disks necessary. In this screen, we can ask the game what to do (which summarizes the plot), head off to adventure, or use the toy box to save or restore a game. Rather than narrating the whole game, let me start by saying that my first step was to make a map. I explored every room and, as I did, I was struck by how well Mr. Lowe captured the feeling and special locations in the Hundred Acre Wood. Lots of locations from the books are present and pretty much every room that has something in it, has something that calls back to one of the Pooh short stories or poems. It’s all very well put-together, but I might not have noticed if I had not just performed a nearly-complete readthrough of every Pooh story ever written. Yes, I know I can get a bit obsessive at times, why do you ask? Kids in 1984 did not have access to spreadsheets. The game’s overworld consists of a grid of five rooms by six, but the majority of the rooms also have something else in them that may be explored further. Rabbit’s house, for example, includes three interior screens. Elsewhere in the wood, there are trees to climb and holes you can spelunk into. I didn’t take a full count, but there are probably about fifty or sixty explorable screens in total, any of which could have lost objects in them. Exactly how the wind is blowing things inside people’s houses is not explained, but it must be a pretty strong wind! 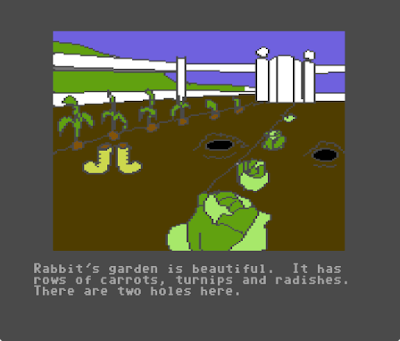 Rabbit’s garden, with a blown-in pair of boots. Once you find the objects, you have to figure out where to take them. 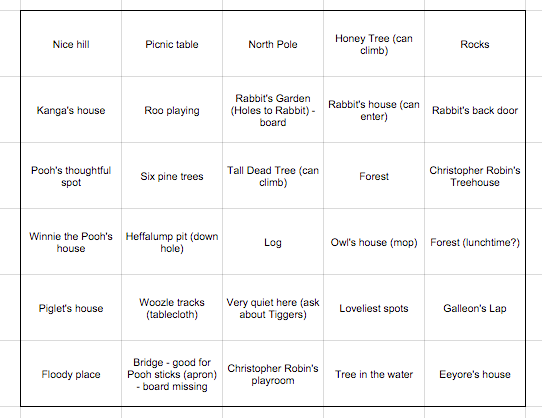 Most of Pooh’s friends have fixed locations on the map and so that is easy enough, but a handful of items have more tricky solutions. 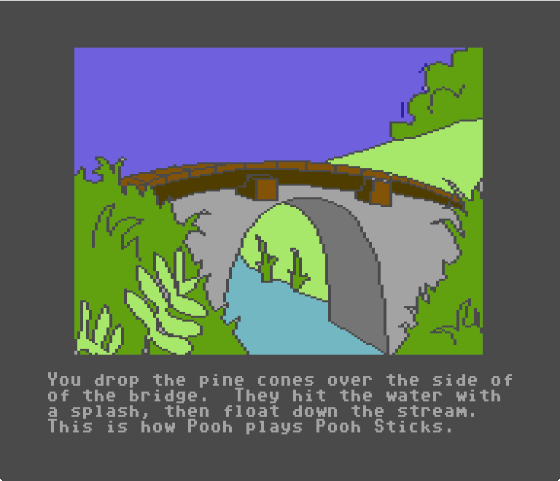 A pinecone that I found on the ground had to be dropped off a bridge, for example, to tie in with a game of “Poohsticks”. Carefully reading room descriptions can give you some hints, but objects like that can be much trickier to figure out a destination for than a lost carrot or Piglet’s scarf. Once you return ten items, the game enters into a final phase. I played through the game twice, each time finding a different set of ten items. In my final playthrough, my items were: 1) a pinecone that I had to drop off the bridge, 2) a small scarf for Piglet, 3) a sign reading “Carrots” for Rabbit, 4) actual carrots from Rabbit’s garden, 5) a drum for Christopher Robin, 6) Eeyore’s tail, 7) balloons for Pooh, 8) a blue crayon for Christopher Robin, and 9) an apron for Kanga, and 10) flowers for Pooh. Obviously some of the items you have to work out through trial and error. While no one other than Eeyore might want his tail, I had to try giving the flowers to many of the forest’s residents before I found who wanted them. I later learned that Owl can offer you some hints, but I never needed them. 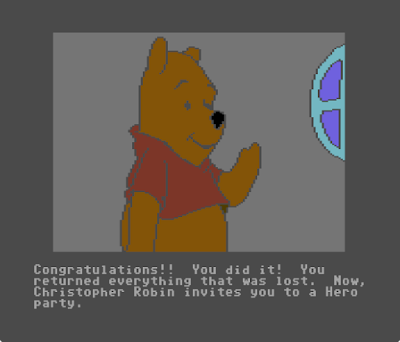 The final phase of the game isn’t difficult at all if you made your map: you must figure out where Christopher Robin is hosting his Hero Party. Fortunately, we found a picnic table in the northern part of the wood. Head there and the game ends: you win! Now that playtime is over, we are left with the difficult task of rating the game. 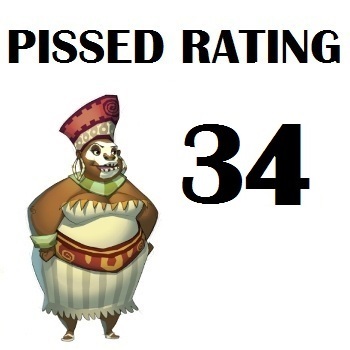 Our very own PISSED rating scale isn’t designed for children’s adventure games, but I intend to apply it anyway. I enjoyed this game a great deal so even if the score doesn’t come out all that high, it’s worth taking a peek. This game does not have inventory puzzles in the traditional sense, but what it does have is well done. Every object has an owner or a key location that it has to be returned to, there are a few inconvenient obstacles, and that’s it. This is trivial for a 37-year old; a bit harder for a 7-year old. The game is also replayable: not only do you find different objects (as there are more than 10 for the game to choose from), but all of their locations are mixed up as well. I played twice just to see how it would go and I still had fun on the second time around. Finally, the use of Owl as a built-in hint system is nice, even if I did not need to explore this in my own play. I originally thought to go with “2” here, but the replayability is a great feature. Three it is! Pinecones and Pooh Sticks: one of the trickier puzzles. On his website, Al Lowe calls this his “Troll’s Tale” engine, the very same that he built for his first game. The interface is excellent for small children with easily-navigable menus and different ways to interact with the game. As you can only carry one item at a time-- and leaving any on the overworld is just asking for the wind to come to scatter them again-- there’s no inventory to speak of. Mr Lowe did a good job squeezing what power he could out of the old systems, and I can’t really imagine a better interface for kids using hardware of this era. It may not be fair, but I still have to judge this game against the more “adult” interfaces being pioneered in 1985. As such, I can’t justify scoring higher than a “2” here. It might be beautiful in its simplicity, but there is neither a functional inventory nor selectable actions. 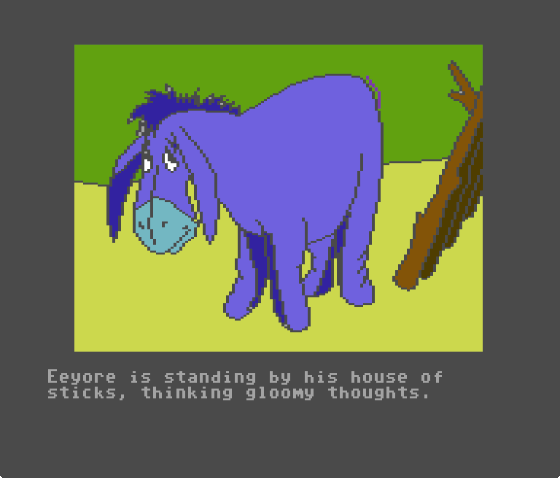 Help Eeyore feel less gloomy by finding his tail. The story behind this game is very simple: there are no plot twists, no character development, nor any change over the course of the game. Eeyore doesn’t become less gloomy if you find his tail, assuming that’s one of the items in your playthrough. Tigger never feels guilty for bouncing you and causing you to drop your stuff AGAIN. You never find the source of the mist, except to say it probably has something to do with dew points. It’s a simple scenario and ends in a party. It’s very fun for what it is, but our rating system tries to be as objective as we can. 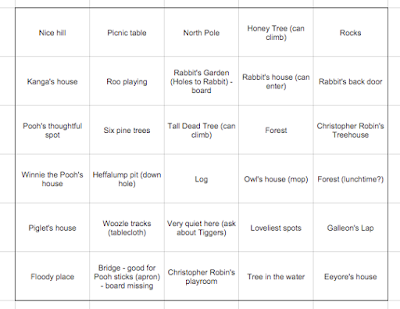 The game’s setting on the other hand is fantastic and well-done, perfectly reproducing the Hundred Acre Wood from the books and the movies, going so far as to be perfectly playable using the map from the book instead of the game. On top of that, almost every area has some connection to a Pooh story from one of the books; it’s a real joy to play when you are familiar with those stories. But to put my “adult” hat on again, almost all of the areas as just places to explore with limited ability to interact with anything: just another screen where an object can fall from the sky. It’s fun, but I wish the environment had been more dynamic. Let’s go with “3” here. 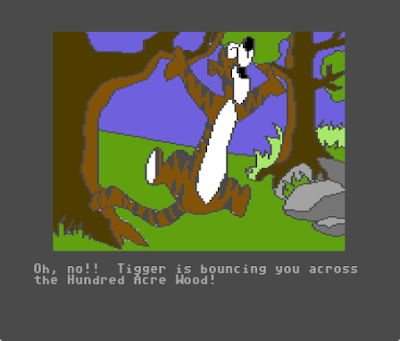 Tigger has his own theme, one of the few occasions of music in the game. The static graphics for this game are great for their time, well composed and illustrated. From reading Al Lowe’s site, it seems that he and his team had access to Disney’s art assets for this game and it really shows. Each scene pops, the characters are well-designed, and they even work fairly well to the limited pallet of the underlying system. I might have hoped for a game based on the E. H. Shepard character designs used in the books, but who am I kidding? 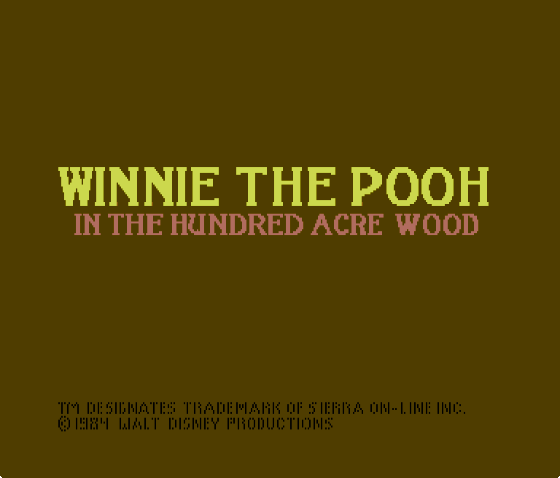 Disney was the one producing this game and their designs have long since become the authoritative look for Pooh and his friends. The game is sparse in terms of sound and background music, but there is some: Tigger gets a song when he appears, plus the “Winnie the Pooh” theme plays when you win the game. It’s not much in the way of music, but it’s something. Very well done for a still-image game, but it’s still “just” an illustrated adventure game with almost no music. I give it a “3”. When I judge environment and atmosphere, I try to describe how the game makes me feel rather than the specific screens and how pretty they are. Let me just come out and say it: I was blown away by this game. Not just in a “it’s a kids’ game” sort of way, but in a very real appreciation of the work that Al Lowe and others put into this. Mr. Lowe perfectly captures the humor and whimsy of the A. A. Milne books, while also interjecting a bit of his own voice. The tone is perfect for what it is, the little asides are genuinely funny, and I had a great time exploring even though I’m three decades older than the target audience. I reached out to Al for some comments, but he had not gotten back to me by “press time”. What I most want to ask him is about his own experience with the Pooh stories. If he wasn’t a huge fan of the original stories, he hides it very well. The game is a love letter to both the books and the Disney movies and I wish I knew whether there was a deeper connection. I may be being swayed by the fact that my son loves Pooh and that I have read a great deal of his stories recently, but at least it has allowed me to appreciate the details that Mr. Lowe has added to this game. Well done! I’m going with a “6” here. That score is very high for a “Missed Classic”, but exactly right for this game. The text in the game is minimal, but every drop of what’s here is well-written and frequently funny; Al Lowe is at the top of his craft. So much of what I like about the game comes in part from the text descriptions and the playful dialog, but I have already written about that at length. The text is just the right amount for a seven-year old, but with my unbiased “adult” hat on again, I think we can’t give more than a “3” for this category. Let’s add up our scores: (3+2+3+3+6+3)/.6= 33! That puts it right up there with the Marvel games that I reviewed and so seems about right to me. I think that simply being a “children’s game” impacted the score a bit, but I really did have a fun time playing this game. In fact, I’m going to give it one bonus point just because it somehow managed to be as fun as it was, even tough I am far older than the target demographic. That makes our final score: 34! This has been a fun and unexpected “Missed Classic” to write about. In theory, I’m going to take a breather for a bit until Cruise for a Corpse comes around… but I never have been very good at relaxing and there are a few games I’ve been itching to play. Until then, in the words of my friend Tigger, TTFN-- ta ta for now! I had completely forgotten about it until I saw the screenshots here. I grew up on a small street on the outskirts of a small town. There were very few other kids to play with, but for a while there was a girl my age that lived in a huge old Victorian farm house - the oldest house in the neighborhood - while her dad renovated it for eventual profitable sale. This girl had a computer and we played this game for hours upon hours when the weather wasn't good for going outside. Her parents were very happy to finally find something that would shut us up and keep us safely in one place. This is surely among the first adventure games I ever played, and I'm really overjoyed to randomly see it pop up here! Massive nostalgia. I am glad to have given you a trip back down memory lane! Don't forget Gelfling Adventure, also 1984! That is true! I also didn't mention "Bop-A-Bet", but I'm not sure if there are more. Congratulations, you have taught me something new about the complete works of Al Lowe today! I would love to play through Mr. Lowe’s back catalog as a series of Missed Classics, but perhaps that will come another day. Also, it's worth noting that at least a few of the other Troll-engine games are essentially reskins of this one (rather -- let's be chronological here -- it, along with Dragon's Keep, were reskins of Troll's Tale.) So playthroughs of those games might well be very brief in regards to any kind of "new business". Just saw an article on Ron Gilbert's blog from last year about Secret of Monkey Island. I definitely remember Donald Duck's Playground and Mickey's Space Adventure, though. DDP was kind of boring - you played minigames to earn money, then spent money on playground equipment, which looked neat but wasn't actually fun to play with (you really just watched). MSA was an actual adventure game though, with inventory to collect and items to use to solve puzzles. It was pretty cool! That one would be worth a Missed Classic entry here. I definitely played those as well. Good (early) times. Al: I do love the Pooh characters. I read several of Milne’s books to my kids and did my best to make my game “feel” like it fit that world. Just one more little note! New Poll: Should we change our colours? Conquests of the Longbow – What the Fulk?